And while the public releases of this propaganda are predictably pathetic, it is also being circulated privately. I received it in an e-mail that had been forwarded by an analyst at an art appraisal group. They had originally contacted me to discuss the possibility of working together. 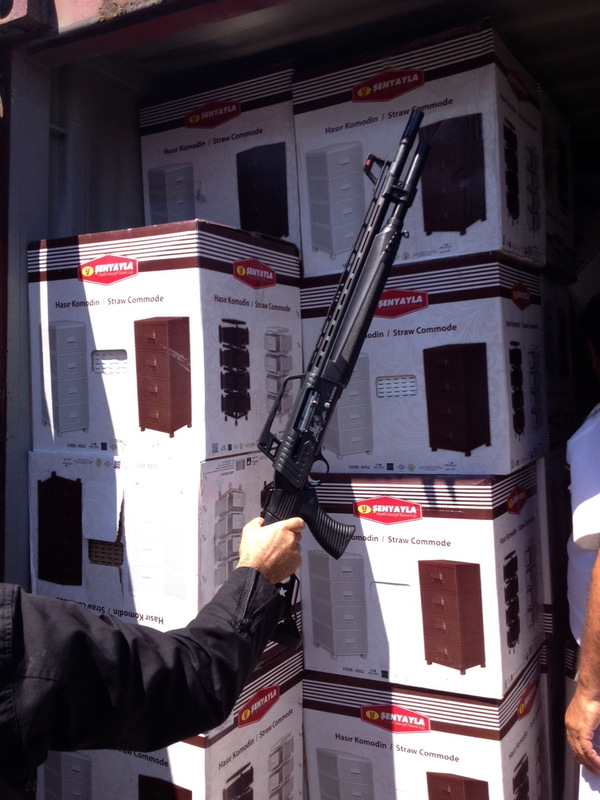 I am in no way defending the arms shipment, but it was not going to refugee camps in Greece; it was never destined for supposed sleeper cells amongst the refugees. And the refugees are just that – refugees. Many of them are dying to save their children from the Islamic State. Many of them are unaccompanied children. If [you] are scared of refugees in Europe, there is a very simple solution – don’t come to Europe. We will not be working together. 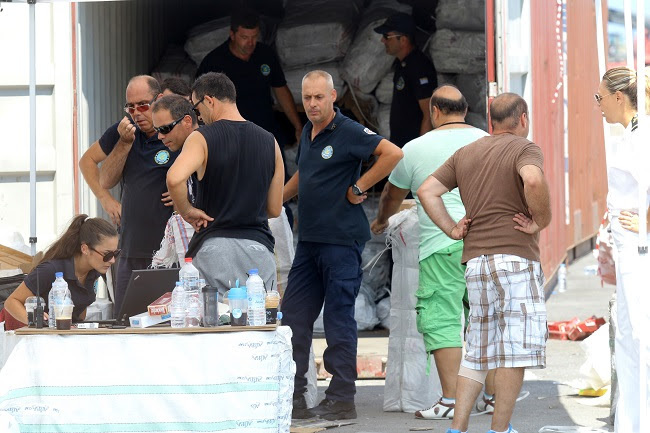 The knowingly misrepresented images have been appropriated from Greece’s Coast Guard, who intercepted the Bolivia-flagged Haddad 1 off Ierapetra near Crete, as it trafficked around 5,000 shotguns, 500,000 bullets and 4,900 cartons of contraband cigarettes. It was carrying those and other embargoed materials from Iskenderun in Turkey to Islamist Libya Dawn-occupied Misrata in Libya (though the ship may have planned to dock at the jihadist Islamic State-occupied port in Sirte). The least worst defence for the undocumented cargo was offered by Turkey-based arms manufacturer Yavex and Turkey’s Foreign Ministry, which claimed that the arms were being delivered to Sudan’s police; the other Turkey-based arms manufacturer that produced some of the cargo, Torun Arms, did not comment. The propaganda alleges that the arms were misdeclared as ‘humanitarian aid’. They were not. There was no documentation to make any declaration and the weapons were hidden behind generic domestic goods. 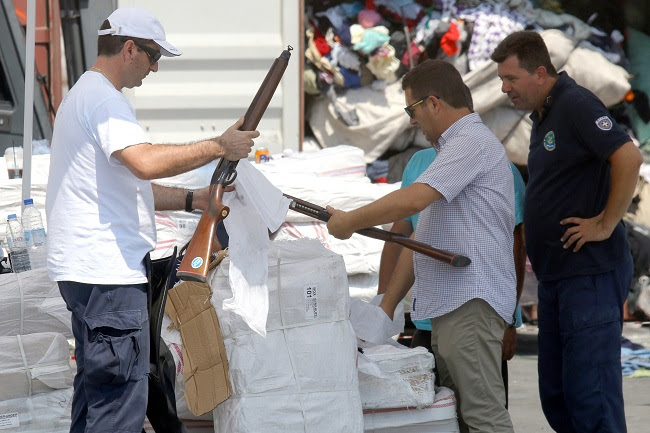 The propaganda alleges that the arms were being shipped to refugee camps in Greece and insinuates that such arms would be delivered to other refugee camps elsewhere in Europe. They were not. There is no way that the ship could have been delivering arms or even humanitarian aid to recipients in Greece or anywhere else in the European Union, because it was already prohibited from entering EU ports for violating safety standards. 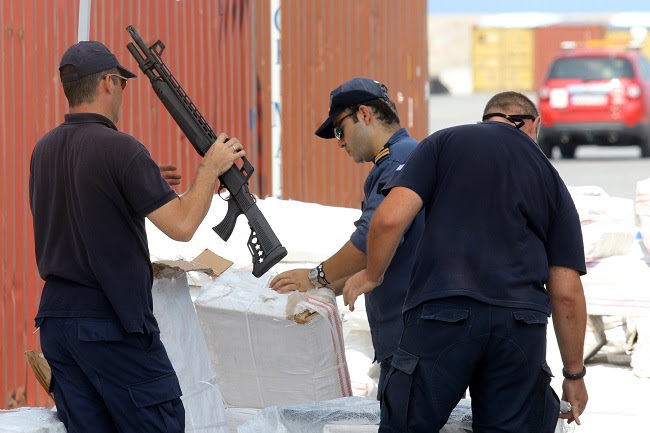 Greek media reported as ‘Breaking News’ the discovery of a weaponry shipment in containers among furniture, at a Greek port. 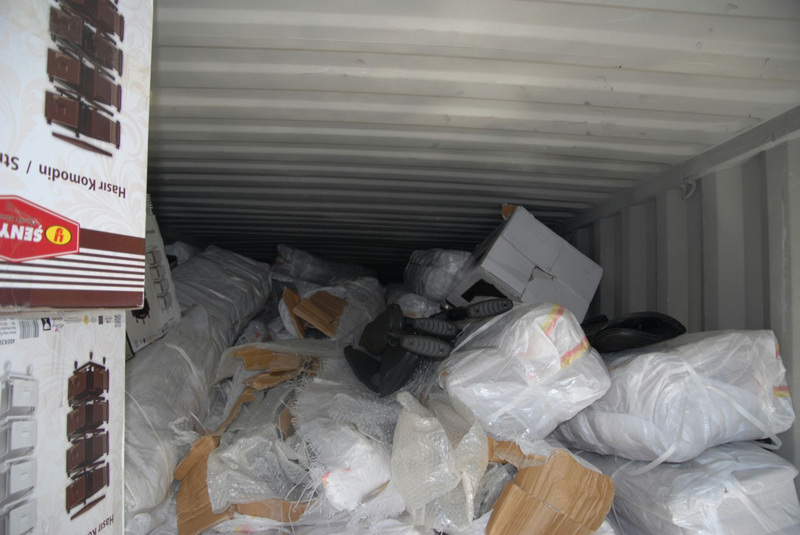 Reportedly, the police found at least two containers with stashed rifles and ammunition, among twelve containers with furniture. 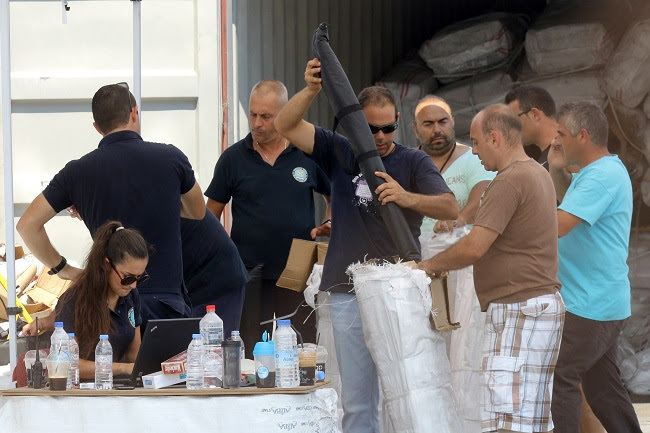 So far, the Greek custom police found 5000 rifles and at least half a million bullets in 2 containers allegedly labeled as the “humanitarian aid” intended to the migrants from Syria who arrived in Greek migrant’s camp. Media speculate if there are other similar “humanitarian” aid shipments for other camps in Europe. The police investigators are trying to identify the sender. In a video released by the Creete TV station Cretapost, boxes with ammo are clearly labeled with US ammo production company Yavex. 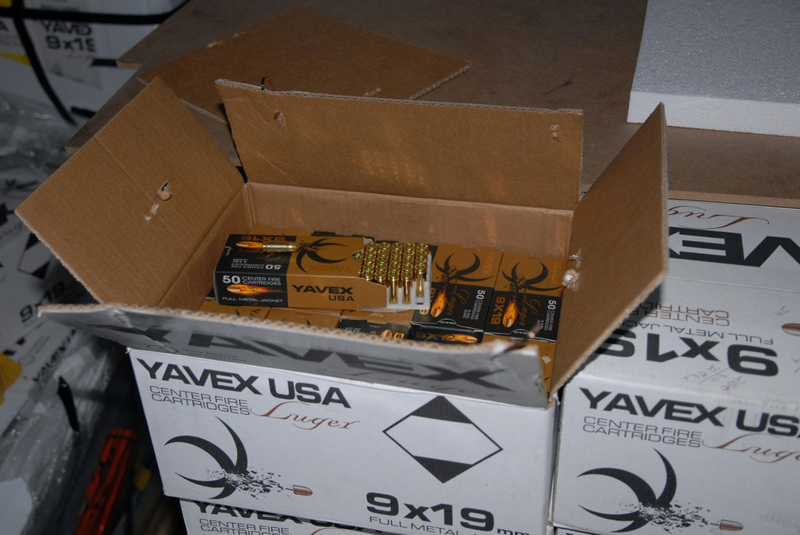 On their website Yavex detailed the online purchasing propositions with the warning that Federal law requires that bayer must be at least 18 years old to purchase shotgun ammunition and 21 years or older to purchase handgun and rifle ammunition. Another video roaming YouTube displays a different story than those seen in mainstream media. The video is a collection of rude and even brutal behavior of younger immigrants, as they steal, break, express violence and throw away water. In addition, the video shows some immigrants from the Syria refugees group that are waving the Pakistan flag. Other violent refugees clearly came from African countries. There are reports that substantial amount of money is needed to travel as a refugee from Syria to Germany. According to the refugees interviewed on the Serbia-Hungarian border, they have paid from $3,000 – $5,000 for illegal transportation across the Mediterranean Sea only. Other reports state that some Turkish NGO’s are paying staggering $11,000 to Syrians who want to migrate to the EU. “For that amount of money, it is possible to settle in many Syrian towns away from the atrocities of war,” one Syrian girl told Serbian reporters. Meanwhile, the amount of migrants in the EU has been growing by thousands every day for more than two years. Germany stated they would accept some 800,000 migrants from Syria, but they will first expel hundreds of thousands migrants that come from poor Balkan countries. 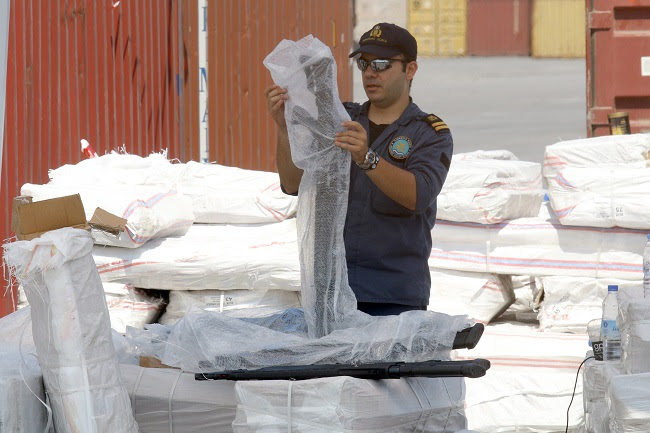 US Weapons found disguised as furniture has been found in Greece, bound for Europe. We can only speculate who they are being sent to. We can only imagine they must be heading for terrorists hidden among the refugees that have successfully made it into Europe. The romantic Kevin Johnson and Leo Rugiens shared the news on Valentine’s Day. The company that manufactured these products are Turkish and are registered to do business in New York and Florida. They have a number of LLCs throughout America, all since the current administration was took over. 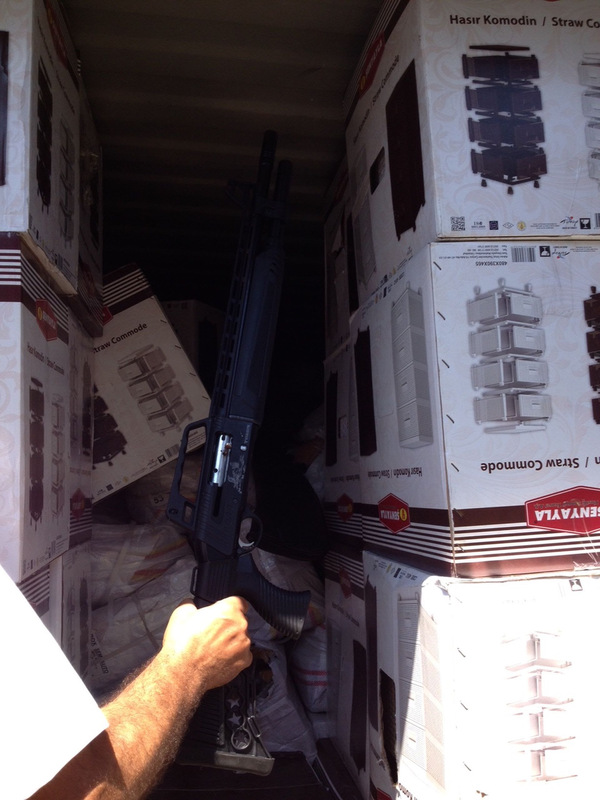 The “furniture shipment” was for refugee camps in Greece, supposedly to make their lives more bearable. Instead of furniture however, the containers transported 52 tons of armaments and ammunition. Greek border security discovered the 14 containers. Congratulations to the Greeks for preventing the arming of the “refugees” at the hands of the Turks. MUSLIM IMMIGRATION, MUSLIM INVASION, MUSLIM CONQUEST, WHAT IS THE DIFFERENCE ? If you have any doubts about Muslim immigration, this might clear up your thinking. 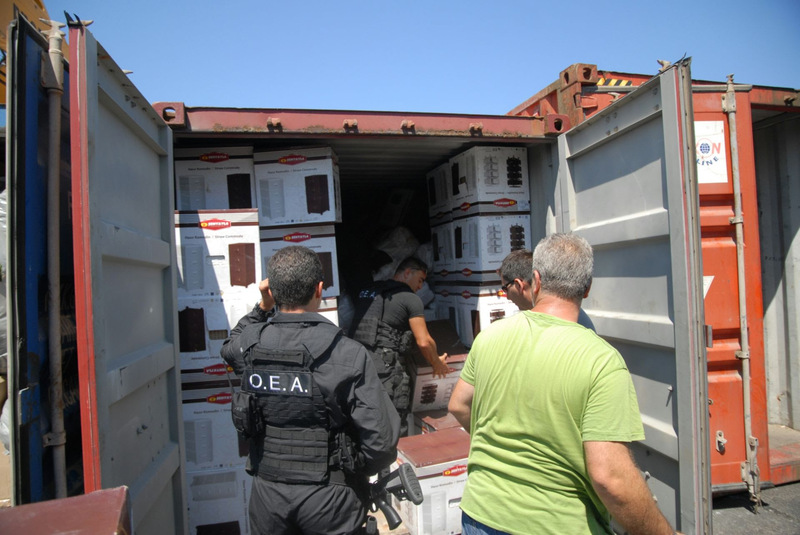 Fake furniture shipment arrives in Greece////////// Furniture?????????? all since the current administration took office. What a strange set of circumstances. to make their life more bearable and ease their hardships. pretending to be furniture but, was discovered by the Greek border securities in 14 containers. than an ARMED INVASION, then nothing will. are taking on the task of traveling all those miles posing as refugees? They are coming…….Like they said they would. Coming to a gun-free place of work / a school / a Gov’t building near you.